Medicinal plants are the nature’s gift to human being to cure disease and make disease free life. Herbal medicine is still the backbone of about 75-80% of the total population (Ali MS et al., 2018). Plant’s secondary metabolites are important sources for scientific and clinical study as well as for new drug development. Many plant synthesized herbal medicines in different formulations used for treatment of various diseases from an ancient time. Traditional or indigenous drugs have special importance. Phytochemicals as secondary metabolites and they can be used in the pharmaceutical industries for producing a potent drug (Nag M et al., 2018). Terpenes are volatile organic compounds which are the major odoriferous constituents of essential oil and e contain two or more 5-carbon isoprene units. Many terpenes contain additional functioning groups, such as carboxyl (COOH), carbonyl (CO), alkoxy (OR) and hydroxyl (OH). It is tested over a long time, and are relatively safe, easily available and affordable (Kupchan, Meshulam, & Sneden, 1978). Many ethno-botanical survey reported that, the local population in different parts of the world including the USA, China, India, Mexico, Morocco, Saudi Arabia, Taiwan, and Trinidad and Tobago depend on medicinal plant and suggested that several medicinal plants have been used as dietary adjuncts for the cure of numerous chronic and severe disease (H Stuppner & Moller, 1993). 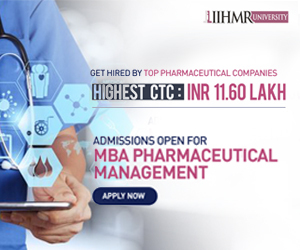 In India and China, the use of herbal medicines has been commonly used from a long time, as a less expensive way to treat various health problems. The herbal drugs are less toxic with limited side effects compared with synthetic drugs (DINAN et al., 1997). Due to such reasons, traditional and complementary medicines have seen an increase in their popularity for the treatment of different diseases. The WHO has also recommended the initiation of studies to identify and characterize new herbal preparations from traditionally known plants and the development of new effective therapeutic agents, especially in the areas where the lack of safe modern drugs to treat chronic diseases. Cancer is a chronic disease and serious health threats for about seven million people in a year and a big challenge medical science (Makar, Saha, & Singh, 2018). In the ongoing search for more effective and safer drugs, attention is being paid to new and safe medicinal herbs or food components. Although phyto-therapy continues to be used in several countries as in the past, only a few plants have received scientiﬁc or medical scrutiny (Kaushik, Aeri, & Mir, 2015). Although most of the herbal plants are safer, still a number of medicinal plants possess some degree of toxicity; therefore it is very important to analyze the traditional therapeutic regimens scientiﬁcally and their dosing, toxicity and other health consequences, before proper use in human diseased conditions. Now a days the environment becomes highly polluted with variety of toxic chemical and waste biological active substances such as dyes, polymers, steroids, phytochromes, or the ubiquitous free radicals (Dinan, Harmatha, & Lafont, 2001).Cucurbitacin are terpenoids category of diverse compounds found in the plants of family Cucurbitaceae. These compounds have medicinal and toxic properties. These compounds are also discovered in other plant families like Scrophulariaceae, Cruciferae, Datiscaceae, Primulaceae, Rubiaceae etc. The diversity of Cucurbitacin lies in variety of its side chain derivatives that contribute to their disparate pharmacological actions. The bitter taste of plant species like cucumber have been identified to the presence of Cucurbitacin. The first Cucurbitacin was isolated as a crystalline form substance in 1831 and was named α-elaterin (Gamlath, Gunatilaka, Alvi, & Balasubramaniam, 1988). Cucurbitacins are found in many cucurbitaceous plants. They are most common in species of the Bryonia, Cucumis, Cucurbita, Luffa, Echinocystis, Lagenaria and Citrullus. The plants of genera Momordica contain a special group of Cucurbitacins called momordicosides. The level of Cucurbitacins varies between tissues. They may be concentrated in fruits and roots of mature plants. In fruits where Cucurbitacins are produced, their highest concentration is achieved on maturity. Seeds generally contain very low concentration of Cucurbitacins. Cucurbitacin producing plants have also been identified outside the cucurbitaceae in the members of Scrophulariaceae, Begoniaceae, Primulaceae, Liliaceae, Tropaeolaceae and Rosaceae. The seeds of certain cruciferous plants, like Iberis species and Lepidium sativum also contain cucurbitacins. It is reported that Cucurbitacins are formed in situ and are not transported to another parts of the plant. The distribution of Cucurbitacins among several families of plant kingdom (Hermann Stuppner, Müller, & Wagner, 1991). Cucurbitacins are a group of highly oxygenated triterpenoid molecules found in diverse species of cucurbitaceae family (Zheng, Fu, & Pei, 2007). They are derived from the cucurbitane scaffold. That are widely present intraditional Chinese medicines, possess strong anticancer activity, andare divided into 12 classes from A to T with over 200 derivatives. All cucurbitacins contain a basic 19-(10→9β)–abeo--10α–lanost–5--ene ring skeleton. A common feature among all compounds in the category of Cucurbitacins is the presence of 5, (6)-double bond. The difference of Cucurbitacins from steroidal moiety lies in the fact that in basic structure of Cucurbitacins a methyl group is located at C-9 rather than C-10. Most of the Cucurbitacins are tetracyclic, but some representatives have an additional ring due to formal cyclization between C-16 and C-24 as in cucurbitacins S and T. The Cucurbitacins differ from most of the other tetracyclic triterpenes by being highly unsaturated and contains numerous keto, hydroxyl, and acetoxy groups. Certain Cucurbitacins have been discovered in the form of glycosides and some of them lack C-11 carbonyl function. Chemically, Cucurbitacins are ranked according to presence of various functional groups on rings A and C, diversity in side chain and stereo chemical considerations. 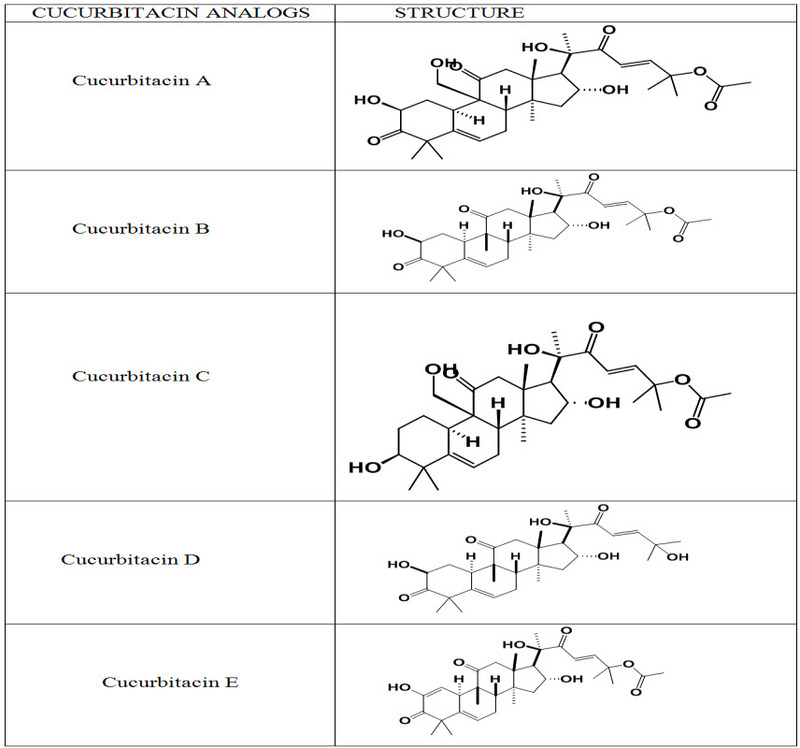 The structural composition of following Cucurbitacins are known and have been designated by the letters: A, B, C, D, E, F, G, H, I, J, K, L, O, P, Q, R and S. The term -“Cucurbitacin” refers to group of Cucurbitacins along with their glyosidic forms mentioned above. Cucurbitacin G and H have same structures but differ from each other in the configuration of the hydroxyl group at position 24 which is not yet established. Cucurbitacin R was demonstrated to be 23, 24-dihydrocucurbitacin D (DHCD) hence, its description has been moved to the group of Cucurbitacin D. Similarly Cucurbitacin J and K differ from each other only in the configuration of hydroxyl group at position 24 which is yet to be determined. A special group of Cucurbitacins are called as momordicosides, named after their occurrence in Momordica charantia. Momordicosides have never been identified in any other plant species. The common feature of momordicosides is that C19 has been oxidized to an aldehyde group. The saccharide linkage is generally present at C-2 (2-O-β-glycosides) in Cucurbitacin glycosides. Majority of Cucurbitacins are usually crystalline in nature or present in the form of needles at room temperature except Cucurbitacin H which is an amorphous solid. Most Cucurbitacins are soluble in petroleum ether, chloroform, benzene, ethyl acetate, methanol and ethanol, but are insoluble in ether. They are only slightly soluble in water. Cucurbitacins usually have absorption maxima for ultraviolet light wavelength (λ) between 228-234 nm (J. C. Chen, Chiu, Nie, Cordell, & Qiu, 2005). Nine cucumber genes are also responsible for biosynthesis of cucurbitacins and elucidated four catalytic steps. The transcription factors Bl (Bitter leaf) and Bt (Bitter fruit) that control this pathway in leaves and fruits, respectively. The Bi gene confers bitterness to the entire plant and is genetically related with an operon-like gene cluster, similar to the gene cluster involved in thalianol biosynthesis in Arabidopsis. Fruit bitterness requires both Bi and the dominant Bt (Bitter fruit) gene. Non bitterness of cultivated cucumber fruit is conferred by bt, an allele selected during domestication. Bi is a member of the oxidosqualene cyclase (OSC) gene family. Cancer is a rapidly growing health threat. Cancer is a group of diseases in which the abnormal growth of cells with the potential spread to other parts of the body. Not all tumors are cancerous in the starting phase and do not spread to other parts of the body. The sign and symptoms include a lump, abnormal bleeding, prolonged cough, unexplained weight loss etc. these symptoms may indicate cancer (Kaushik et al., 2015). The cancer is a serious diseases cause 8.8 million people worldwide died from cancer in 2015. That is nearly 1 in 6 of all global deaths. Only 5-10% of all cancer cases can be attributed to genetic defects, whereas the remaining 90-95% has their roots in the environment and life style. The life style factors include cigarette smoking, diet, alcohol, sun exposure, environmental pollutants, infections, stress, obesity, and physical in activity (Teuscher, 1994). The evidence indicates that of all cancer related deaths, almost 25-30% are due to tobacco, as many as 30-35% are linked to diet, about 15-20% are due to infections, and the remaining percentage are due to other factors like radiation, stress, physical activity, environmental pollutants (Enslin, Joubert, & Rehm, 1956). 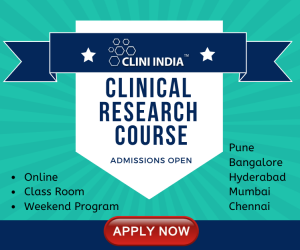 It presents the biggest challenge to researchers and medical professionals and has been selected for various prevention and therapeutic strategies. The dietary intake of many vegetables and fruits has been found to reduce the risk of occurrence of cancer. Cancer is the deregulation of apoptosis that programmed cell death. Several promising targets for intervention is identified by studying the molecular abnormalities that tumor genesis, such as the signal transduction pathways that regulate apoptosis. In this perspective, cucurbitacins and its derivatives have become a new focus for cancer treatment because of their strong capability to inhibit several cancer. 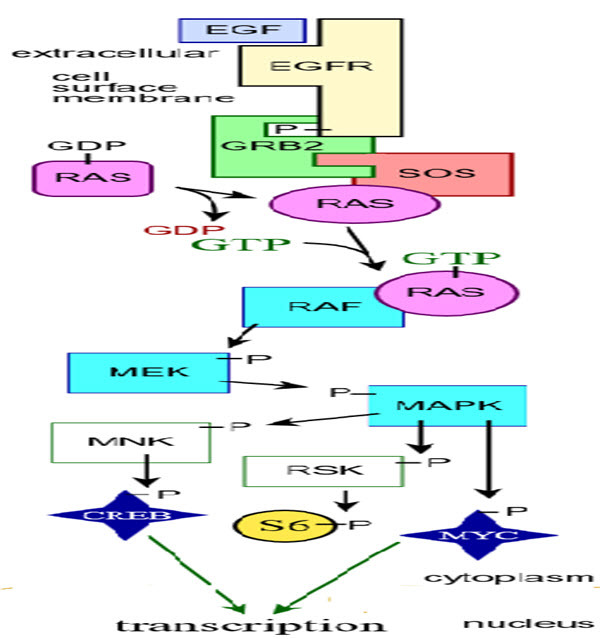 The target area of cucurbitacins and its derivatives through JAK/STAT pathway, Wnt signaling and MAPK pathway (Njoroge & Newton, 1994). Cucurbitacin and its derivatives are inhibited cancer growth via a wide range of mechanisms, including proapoptosis, induction of autophagy, cell cycle arrest, inhibition of cancer invasion, and migration. Cucurbitacins also modulate multiple intracellular signaling pathways. It is interesting that each variant of cucurbitacins may trigger slightly different molecular signaling cascades in different cancer cell types to inhibit cancer growth and progress (Lavie, Willner, & Merenlender, 1964). 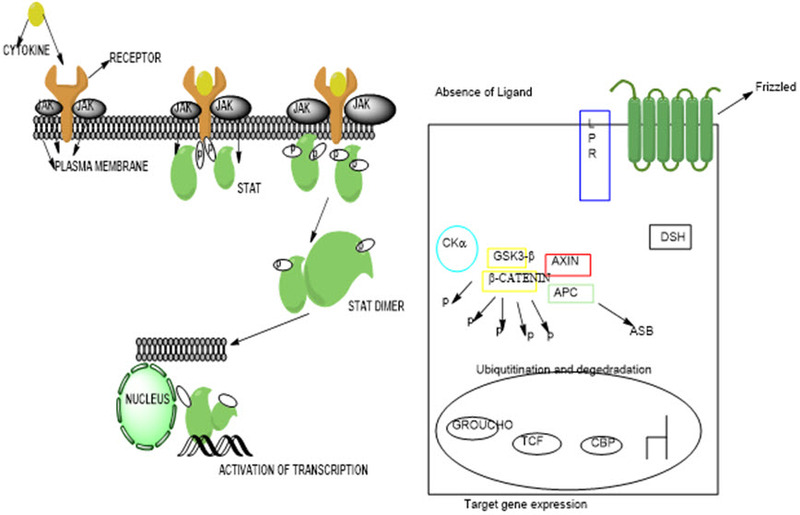 Signal transducers and activators of transcription 3 (STAT3) and Janus kinase (JAK) signaling pathways are the main mechanisms for cucurbitacins to induce apoptosis to exert their potent anticancer effect. In addition, the ability of cucurbitacins to induce cell cycle arrest in G2/M phase mediated by various regulators is also an important way to ﬁght against various cancers (Bartalis & Halaweish, 2005).